BestBottles.com offers an extensive selection of perfume vials, perfume bottles, decorative perfume bottles, roll on bottles, and apothecary style bottles for use in storing perfumes( fragrances) and essential oils. To learn more about our various bottles please click on the links below. To order the perfume bottles, please use the links on the left hand side. BestBottles.com offers a wide variety of clear and colored glass vials and a range of small perfume bottles. Glass vials are made from long tubes of glass. The glass tubes come in clear, green, cobalt blue and amber colors. These tubes of glass are made into glass vials in machines that form the mouth of the vial and the base by heating and melting the glass. The heating, melting and forming is usually done in a continuous process. 0.5ml Clear glass perfume vials with plastic rod applicator. 2ml glass vials available in clear, amber, green and cobalt blue colors. The clear and amber glass vials are thin and tall with a screw cap of size 8-425. The Cobalt blue and green vials are shorter and wider with a screw cap size of 13 – 425. The thread size of the 1 dram vials is 13-425. Plastic reducers are also available for the 13-425 size glass vials. 10ml clear glass vials. The caps on these vials are available with and without a glass rod. Our colored glass vials are not painted bottles, the glass itself is colored. The colored glass vials are used in the aromatherapy field for storing essential oils. The blue, green and amber colored glass can absorb certain frequencies of light and thereby help in preserving the essential oil. The Amber vials are less expensive than the blue and green colored glass vials because they are produced in much larger quantities as they are also used in the pharmaceutical industry. Small perfume bottles in a variety of shapes, sizes, colors and caps of different designs are available. The perfume glass bottles differ from the glass vials in the way they are made. Glass bottles are usually made in a mold. These can be hand made individually, or in semi automatic or fully automatic machines. Most of the bottles in this section are made on fully automatic machines. The smaller perfume bottles we offer are available in the following sizes, 1/3oz (10ml), ½ oz (14ml), 1oz (28ml) and 2 oz (56ml). The 1/3oz size bottles are available in rectangular shaped clear glass with dome or minaret shaped caps. The caps are gold, silver or copper color metallized caps. The ½ and 1oz bottles are available in clear and cobalt blue glass. The clear glass bottles are available in a rectangle shape bottle, or a “diamond” shaped bottle. Cobalt blue bottles are available in a cylindrical boston round shape in 1/2oz, 1oz and 2oz sizes. A 2oz diamond shaped bottle in clear glass with black cap is available. Roll on bottles are also referred to as roller bottles. The roll on bottles have a plastic roll on ball and housing. As the ball rolls it picks up the perfume or essential oil and applies it to the surface. The caps of roll on bottles have a special ring on the inner side. This ring presses on the ball when the cap is tightly shut. The pressure on the ball prevents leakage of the product. We offer 3 sizes of roll on bottles – 5ml (1/6oz), 10ml (1/3oz) and 28ml (1 oz). All of these are all tall cylindrical glass bottles. The 5ml (1/6 oz) size bottles are available in clear glass and are offered with a gold or silver metal shell cap. The 10ml (1/3oz) size bottles are offered with a white, black, gold, silver or copper colored cap. The white and black caps are made from phenolic, a type of plastic material, which gives them a hard and nice feel. The gold and silver caps are either metallized or metal shell caps. The copper colored ones are metallized caps. The 10ml bottles are available in clear plain glass, frosted glass, swirl design glass and swirl frosted glass. The 1oz roll on bottles are available in clear glass with black or white caps. The roll on bottles are usually shipped with the bottles, roll on housing with ball and caps . After filling the bottles, the roll on housing and ball should be fitted into the mouth of the bottle. The roll on housing and ball is fitted by pushing the housing into the mouth of the bottle. 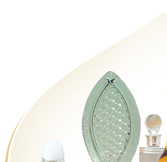 BestBottles.com offers an extensive selection of small decorative perfume bottles. The capacities of the small perfume bottles range from about 3ml to 15ml (1/2oz). These perfume bottles are great for giving as gifts, for travel size products, for party and wedding favors, etc. Most of the unique shaped bottles such as the heart shaped bottle, leaf shaped bottle and others are hand made in small glass furnaces. Because they are hand made, their capacities are not exact. There will be variation in the capacity of the bottles. The capacities listed for each of the bottles are approximate. There are three broad categories of bottles in the small decorative perfume bottles section. Clear glass octagonal shaped bottles. These are available in 3 sizes: 3ml, 6ml, and 12ml. These bottles come in a clear glass style or with decorative printing along the edges. The bottles are available with gold and silver caps. The regular bottles come with a plastic rod applicator. We have a roll on ball and housing that can fit onto these bottles. Please inquire if you want to purchase with a roll on ball. The roll on ball and housing are available at an extra charge. Decorative bottles in different shapes with metal screw cap. Small decorative bottles in different shapes such as heart shaped bottle, sunflower embossed bottle, leaf design bottle, rectangular shaped bottle with fluted surface , and bottles with sun and moon embossed on them are available. The heart shaped bottles are available in clear and blue glass. The heart shaped bottle are available with a key chain in addition to the traditional cap with tassel. Decorative perfume bottles with glass stopper. Teardrop (genie) shaped bottles and rectangular shaped bottles are available with glass stoppers. The rectangular shaped bottles also have a glass rod applicator attached to the glass stopper. These stoppers have a plastic ring on the glass stoppers that make a leak proof fitting. But, the glass stoppers can come off during shipping. Therefore these bottles should not be shipped filled with fragrance. The fragrance can accompany these bottles in a glass bottle with a screw cap. 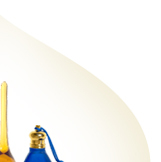 BestBottles.com offers an extensive selection of large decorative perfume bottles. These perfume bottles are great for giving as gifts and for use as table top accessories. Most of the large decorative perfume bottles are hand made in small glass furnaces. Because they are hand made, their capacities are not exact. There will be variation in the capacity of the bottles. The capacities listed for each of the bottles are approximate. We offer a unique selection of apothecary style glass bottles with ground glass stoppers and ground neck in a number of different sizes. The ground glass and neck provide leak proof fitting. The apothecary style bottles are available in 1oz, 2oz, 4oz, 10oz and 12oz sizes. They are available in 3 different colors, clear, green and cobalt blue. All of the sizes are not available in all colors. Although the ground glass stoppers provide leak proof fitting, they cannot be shipped filled with a liquid such as an essential oil or fragrance, because the stopper can come off during the shipping process. Therefore, it is important to ship the fragrance, essential oil or any another product in a separate bottle that can be securely closed. This section offers beautiful decorative bottles in various shapes and styles, decorated with metal and beads. All of the bottles have a metal cap with a metal rod applicator. The caps have a screw thread with a washer. Most of the bottles are available in both golden and silver colored metal decorated with beads of different color. The capacities of these bottles range from 1/3oz to about 1 ½ oz.